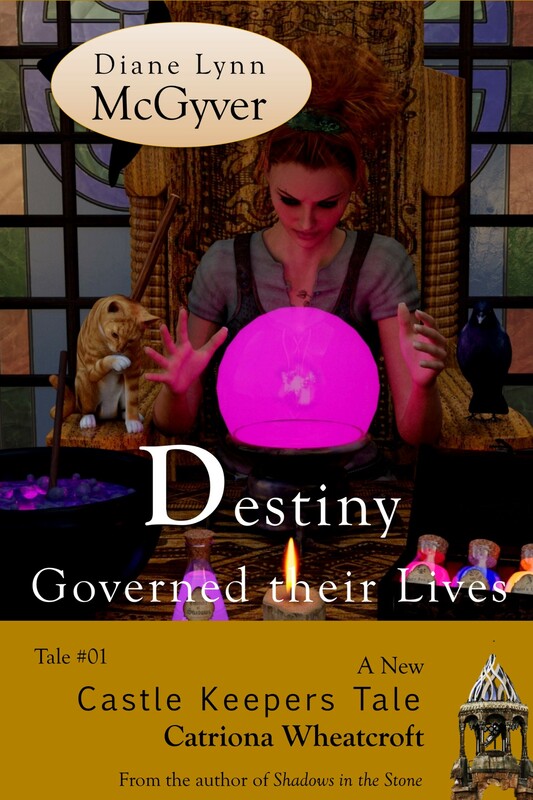 If you love playing with magic and reading shocking outcomes, you’ll enjoy Diane Lynn McGyver’s short Story Destiny Governed their Lives. One might call it a character story or a back story. It’s both, revealing the turning point in Catriona Wheatcroft’s life. It exposes the source of her pain she keeps hidden from everyone in <em>Shadows in the Stone</em>. It’s a quick, easy read and the first introduction into the world of Ath-o’Lea and the adventures that lie ahead. Destiny Governed their Lives is the first in the Castle Keepers Tale series that will have you wondering what’s next? It will introduce you to the Wheatcroft family and the oldest member’s dreams of becoming a sorceress. Brace yourself for the ride to another time and place. Buy Destiny Governed their Lives today and begin your journey into the Land of Ath-o’Lea where magic and sword clash. Diane began the Castle Keepers Tales to share extra stories about the characters who appear in The Castle Keepers novel series. Each is a stand-alone story, often telling a tragic event that happened in the past, before the first book, Shadows in the Stone. Through these stories, readers can better understand the characters and appreciate a little more of why they act as they do. We are all products of our past and pivotal events shape us into whom we are. These stories are not spoilers for the books, but enhance them. If a story does prove to undermine the enjoyment of a book, I’ll make note that the book should be read first. Otherwise, enjoy these tales without worry. The piercing sounds of people screaming and shouting assaulted her ears. Her eyes widened as four large horses galloping down the centre of the street. The male riders wore armour and wielded swords. They swung at innocent bystanders too slow to get out of their way. Catriona watched a citizen fall victim to the blade. Blood stained his shirt and he squirmed in vain. Her throat pulsated, and she clamped her hand over her mouth to douse the shriek. Home. She needed to get there now, but the horses and fighters stood in her path. Pushing her way towards the nearest shop, she fumbled along the sidewalk, hoping to keep the wall of people between her and the intruders. Others had the same idea, and she found herself shoved in the direction of the street. She staggered forward, looking for an escape route. She spotted an alley and rushed towards it. After tripping over a woman who struggled to keep her child near, she fled into the passage and behind the stores. As she ran, the noise of the commotion faded in the distance. Terrified the fighters might rein their horses in her direction, she ran blindly past several buildings until she tripped over a wooden crate. Picking herself up and pushing her skirt into place, she scanned the area to see how far she had come. “Barker’s Leather Store.” She gasped for breath. “Almost home.” She turned to run, but a force abruptly shoved her against a wall. “Luvly. A beautiful woman with something I want.” The dwarf who held her stood barely tall enough to hold the dagger to her throat. His unkempt beard covered most of his face but could not hide the gaping hole created by two missing front teeth.